In years past, the mountains of Wudang were known for the many Taoist monasteries to be found there, monasteries which became known as an academic centre for the research, teaching and practice of meditation, Chinese martial arts, traditional Chinese medicine, Taoist agriculture practises and related arts. As early as the Eastern Han Dynasty (25-220AD), the mountain attracted the Emperor's attention. During the Tang Dynasty (618-907), the first site of worship - the Five Dragon Temple - was constructed. The monasteries were emptied, damaged and then neglected during and after the Cultural Revolution of 1966-1976, but the Wudang mountains have lately become increasingly popular with tourists from elsewhere in China and abroad due to their scenic location and historical interest. The monasteries and buildings were made a UNESCO World Heritage Site in 1994. 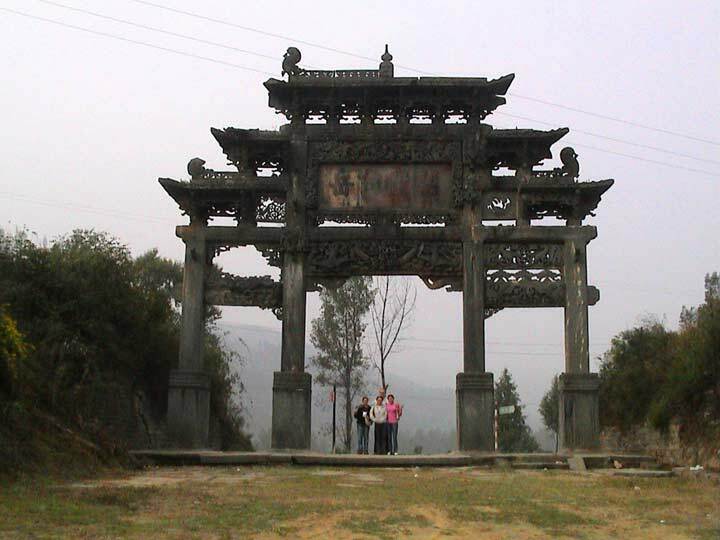 Ancient Gateway to Wudang Mountain. Temple built into the side of a cliff on Wudang Mountain. Rebecca Kali on a scenic spot on Wudang Mountain. Courtyard of the Wudang Wushu Academy. Mark Johnson on Wudang Mountain. Painting of Lao Tzu riding a buffalo. Ancient grave on Wudang Mountain.